Arne Jacobsen (1902-1971), architect and designer. Educated at the Royal Danish Academy of Fine Arts, School of Architecture in Copenhagen, professor at the Academy (1956-65). 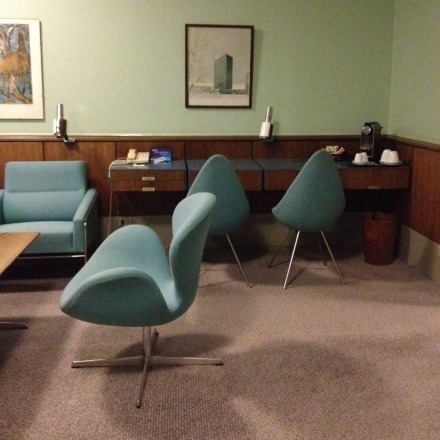 As a designer, Jacobsen made prototypes for furniture, textiles, wallpaper, silverware etc. Among his most famous designs are The Ant (designed for Novo Nordisk canteen) (1952), Series 7 (1955), The Egg and The Swan (designed for the SAS Royal Hotel ) 1958, and the tableware Cylinda-Line (1967). Among his most famous works as an architect are the apartment blocks Bellavista in Klampenborg (1933-34), Bellevue Theatre (1935-36), Århus Town Hall (in co-operation with Erik Møller) (1939-42), Søllerød Town Hall (in co-operation with Flemming Lassen) (1940-42), Søholm semi-detached houses in Klampenborg (1950-54), Rødovre Town Hall (1957), Glostrup Town Hall (1958),The Munkegård School in Copenhagen (1955-59), SAS Royal Hotel Copenhagen (1958-1960), Toms Chocolate Factories in Ballerup (1961), Danmarks Nationalbank (started in 1965), Saint Catherine’s College in Oxford (1964-66). Jacobsen also designed a project for the lobby of Hannover Concert Hall (1964-66), Castrop Rauxel mall (1965), Christaneum Grammar School in Hamburg (1965), Administration building for the Hamburg power station (in co-operation with Otto Weitling) (1965).